With outdoor rooms and entertaining areas a must-have in today’s homes, Xterior Designer™ makes it easier for you to colour match your garden and interior design to create a seamless and aesthetically pleasing alfresco area. Our Colour Swatch matching system will allow you to match the colour and hue of plants with your planned or existing colour scheme. Whether you are looking for a flowing environment from inside to out, or a high contrast scene to depict the change in rooms, Xterior Designer™ will have you coloured. Xterior Designer™ is simple and easy to use. Just match your pots, cushions, prints, etc, with your desired plants! With a wide range of plants included in the Xterior Designer™ Colour Swatch system, there is a plant to suit everyone’s taste. These plants have been chosen for their high impact colours and great garden impact form, making it even easier for you to have a garden that looks like it has been designed by a professional. Xterior Designer™ is a new concept from Touch of Class Plants, it is due to launch spring 2011… So what is it all about? The Xterior Designer™ concept is focused on colour, not just of plants but everything outdoor and also on plant placement in a garden. With outdoor rooms and entertaining areas a must-have in today’s homes, Xterior Designer™ makes it easier for consumers to colourmatch their garden and interior design to create a seamless and aesthetically pleasing alfresco area. Plant selection is as easy as one, two, three and gives your customers the confidence to create a garden that looks complete, comfortable and professional. The Xterior Designer™ label features a fashion and styling sales angle in the colourswatch side panel. The “fashionista’s” see this colour selection before the plant and will most likely make their decision based around these colours. “Fashionista’s” will also be inspired by an example of matching and complementing items and accessories and before you know it they will have selected their plant colour scheme and be off to the gift shop matching cushions and candles. Xterior Designer™ plants are given a rating of 1, 2 or 3; this rating is clearly located on the label and informs and educates consumers in relation to plant placement in a garden. The Xterior Designer™ plant rating system give consumers the confidence to make informed choices based on this easy to grasp concept. 1represents frontal plants including groundcovers and small shrubs, 2refers to medium shrubs suitable for the mid section of a garden bed. 3relates to small trees, hedging and screening plants used to create a backdrop to a garden bed. The label features a recommendation to use a combination of all three levels to achieve a garden that is professional and multi-layered. Women aged between 25 and 45. Existing customers visiting your gift shop, café or outdoor furniture departments. Cross promote plants with outdoor furniture, gift ware and soft furnishings. Promotes the fashion of decorating your exterior as you would your interior. Gives easy options for non gardeners. The Xterior Designer™ product range will be limited to two to three wholesale growers in each state, this will ensure that the Xterior Designer™ range will only be supplied to Xterior Designer™ registered retail nurseries, and therefore keep the range exclusive to those nurseries. The Xterior Designer™ range will consist of native and exotic great garden plants including new release product and proven garden favorites. The initial range will include grasses, groundcovers, small, medium and large shrubs accent plants and small trees. This range will always be increasing. We realize that to create a balanced garden, other types of plants are required. We will be talking to seedling producers and an advanced tree grower to complete the range and broaden the possibilities for retailers. XteriorDesigner will be available to a small group of retailers in each state, this will ensure the concept is executed as designed and maintain its exclusivity. The following criteria will apply to XteriorDesigner stockist. All Xterior Designer™ labeled product to be displayed together in one area. Xterior Designer™ banner placed in Xterior Designer™ designated area Corflutebanners are available in AO size at a cost of $45.00 or A1 size for $35.00. A minimum of 20 per selected variety to be stocked. 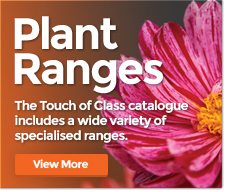 Plant selection from the range will be at the discretion of the retail outlet, it is important that this minimum is stocked as the concept encourages simplified gardening using multiples of a chosen range of plants.